Email has become an integral part of business and it’s crucial to include it in business continuity planning. It’s inevitable that email systems will fail and the business can assess the risks and provision systems to avoid the costs of lengthy email outages. But traditional approaches to availability and recovery may not offer adequate protection for email systems at an affordable price, especially as it is now often a legal obligation as well as a business necessity to ensure that no messages are lost. Indeed, email is particularly important during a disaster, when staff will need to keep in touch more urgently than usual; they will also be under more stress so providing a transparent and familiar system is key. Invoking a business continuity plan is expensive and therefore reserved for significant disasters. 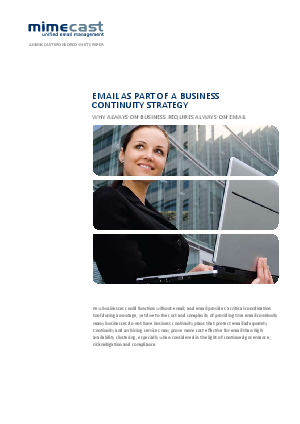 To this end a service-based email continuity solution may well be the best approach for both reliability and cost. Having an email continuity solution that can be invoked at minimal cost and with minimal disruption provides the additional benefit of providing flexibility in the patching and upgrading of the email server.